Blog / Weekly report 08/17. We are working with EOS blockchain for almost 2 months. And we are really excited because of the Blockchain’s speed & free transactions. And Today is a special day for us. We are the first in the world who launch EOS Token contract. Token contract is the base for all blockchain projects and for ICO process. During the next weeks, Crowdsale contract on EOS will be released and it will open EOS Blockchain for the projects which plan their ICO. 1. EOS account creation launched for Main & Test net. 5 minutes to enter the quick and easy deployment of decentralized applications. 5 minutes to one of the fastest blockchain designs (over a million transactions per second). Cost: 0,05 ETH plus the 100% guarantee and security of every single step. More than 20 accounts were already created. 2. EOS token contract was launched. Now everyone can create EOS token on MyWish Platform. Specify Token owner, Total supply, and The name. And it’s done. We are suggesting to change our current model, and burn the 15% “the bonus for execution miners” or Airdrop it to WISH holders, you can share your opinion with us on Telegram: https://t.me/MyWish_platform. We have finished recording (Airdrop, Investment Pool, Crowdsale) contracts tutorials, all of it will be available on our youtube channel today. New partnerships with LimeICO Includes marketing awareness campaigns from their side and Promo Code for their clients from our side. We still getting more partnerships offers from other companies. 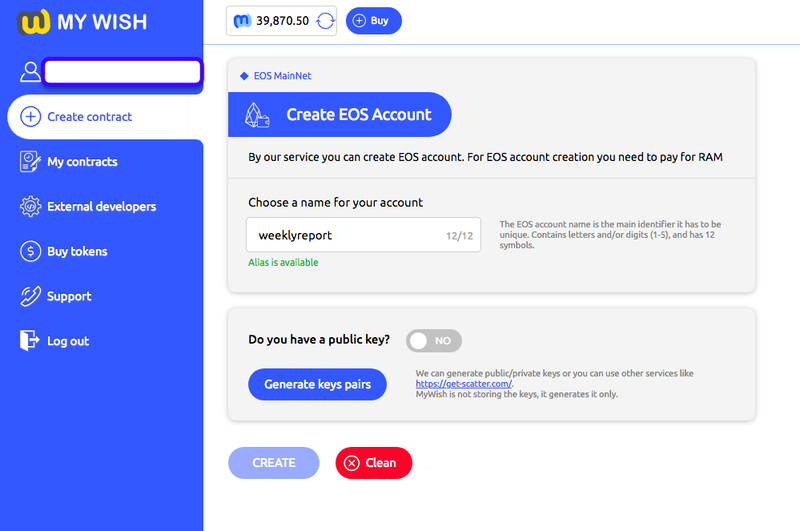 Now you can create your EOS account with the private key on MyWish platform in less than 5 minutes, you can read Vladimir’s article about EOS creation here. We have started a Google ads campaign, it passed the moderation and the campaign has started. As for features of this market, we have several competitors, some of them provide this service with cheaper price, but it is not comfortable to use, because in order to create an EOS Account clients should use an external source for the private key generation. By the contrast, MyWish Platform provides its customers with the full cycle of EOS Account creation. We care about our clients time. In addition, we guarantee the safety of their Accounts. Also, our competitors don’t use Google Ads yet giving us the opportunity to leave them behind. 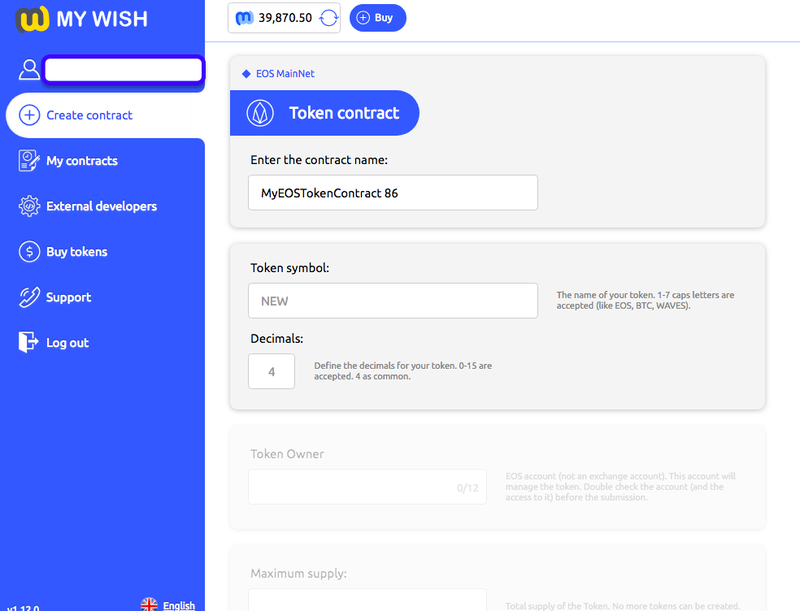 Now officially you can create your token contract on EOS blockchain using MyWish platform, we started the marketing campaign on our social networks. Soon you will be able to change our official site language to Chinese or Japanese, we are adding the languages to our official site. Despite the fact that we have released EOS Account in our platform just on Monday, However, on Thursday 20 EOS Accounts were created. We believed that the full integration with EOS would be great for MyWish.